(3 & 4 year old group). 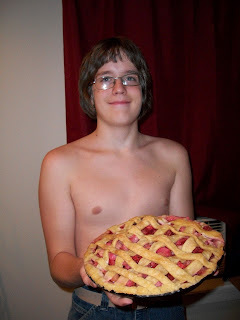 All I needed was a bit of prep so they could be successful. I started out with some Craft Sticks, some yellow poster board, some cotton fabric scraps (I'm a quilter after all! ), a bit of ribbon, glue and a stick on star. Dh cut down some of the craft sticks for me using tin snips. He cut one at 5" for Joseph and one at 4" for Mary, retaining the end of the 4" stick for Baby Jesus. We drilled a hole in the end of an uncut stick for the support backing. After drilling the hole, I used a 10" length of ribbon, running it through the hole for a hanger. I used a threader for my serger to thread the ribbon through the hole. 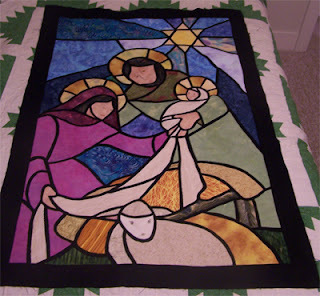 I had the Boybarian punch three 1" circles from yellow poster board (card stock should work just as well), cut one piece of swaddling clothes at 1 1/2" X 2" for Baby Jesus, a piece of cloth for Mary at 2" X 3" and a piece for Joseph at 2" X 4". All the prep work was finished and we were prepared for crafting time! Each of the three cut sticks received glue and a yellow halo circle. We set these aside for a couple of minutes as the halos wanted to slide around. This was a great time to go play a game (though the crafters wanted to continue the project!). When we came back, each crafter put two dots on for eyes. We used a Sharpie, and it did bleed a little bit :( It did not bother the Cubbies, so we moved on. We placed the fabric, pretty side down, on the table. We spread glue on the back of the craft stick, trying to keep the glue in the same size as the fabric height. Push first one side and then the other onto the back. Smooth the fabric into the glue. If you use cotton fabrics, the glue should come through the layers enough to hold the fabric in place. Do this for each of the three people. Above the family, stick a shiny star sticker. If necessary (I considered it important when working with little hands), use a binder clip to hold the layers together until the glue has set. Design Wall Monday ... more UFO blocks! in my sorting and organizing I have come across a LOT of UFO blocks from various swaps ... here are some up on my wall. I think I have more of the Red/White/Blue ones somewhere, I just can't think where they would be! I am close to being done with my organizing of my Sewing Dungeon. I am SO itching to getting back to work on various projects! Though it sure is fun to find things I hadn't seen since our move! These five boxes (notice 4 of them are Dish Packs) were all unpacked in the last two days ... not everything has been organized into its eventual home, but it sure is nice to have more boxes unpacked and floor space cleared in the basement. BUT I really do not enjoy organizing all of the fabrics and patterns (and other goodies) as unpacking and petting all the fabric sparks creative ideas and I would much rather work with the fabrics than organize them. 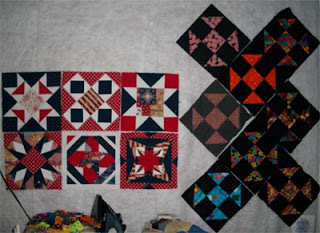 This is the project I started for Project Quilting's Offseason Challenge. It may have been a challenge with a two week deadline, but I have not been able to accomplish it in the time given - if I didn't have kids at home and if I weren't involved in various things ... maybe I could get things done. AND this quilt insisted on being big. I've never done a Stained Glass style quilt before so I was winging it. Not the best way to do a quilt ... next time I'll know how to do some things in an easier fashion and save TONS of headaches! I am loving how it is turning out, just wishing I had it finished! I finally found the missing sewing/quilting boxes from our move and thus have been able to start organizing my new Sewing Dungeon! YAY! AND I made lots of soap (no pics yet). 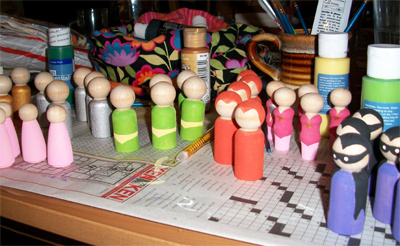 Now I'm working on painting little people pegs. I will be packaging them up in little bags made of fabric I designed (see below). I'm getting pretty excited to see them all done (and hope they are well received at the craft show!). We are still alive and already busy in our new location *sigh* I always liked moving because we were not so busy for the first few months. 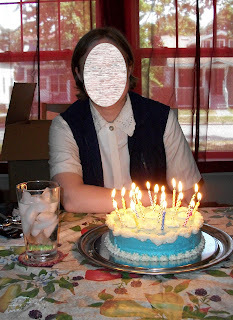 We have started up our more formal homeschool year. The Boybarian had his first lab today and nothing blew up (the Army Guy was a little bit disappointed, but HE wasn't to supervise the lab). I have a design wall!!! My sister came down and helped me do some unpacking and setting up in my sewing/quilting area. 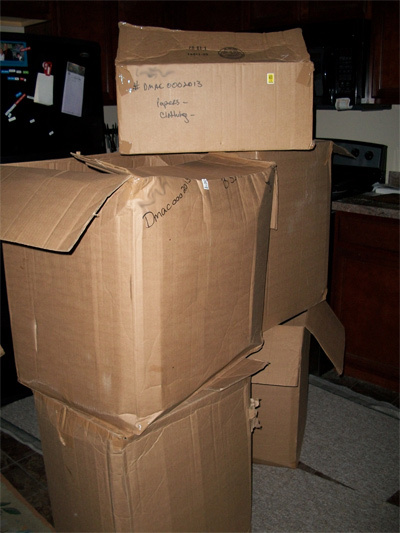 What a relief it is to finally have more than piles and piles of boxes in one room (other rooms still suffer). On my design wall are a bunch of stars from a swap, a pair of test blocks and a bleach dispersed piece of fabric that is inspiration for an art quilt. These are all pieces that make me happy, so the might just inspire me! My design wall is in a somewhat awkward place as it is behind the ironing board. And with unpacking, the ironing board is a mess. I have yet to find my iron, so it may be in this condition for a bit longer. I'm still unpacking boxes and trying to find where to put things in a more compact space (though much nicer than my last digs). The top on the frame is one I made over 17 years ago, it was unearthed in a box last week. I think I'll work on this one first to get back into the groove of machine quilting. The tall cabinets are for fabric storage. They have SOME fabric in them, but are still awaiting the bulk of my fabrics...that are somewhere, in a box, in the house or garage! This is what my designated Sewing Dungeon looked like Saturday at noon...since then I moved the cabinets, went through almost all of those boxes, and felt very frustrated. yes, there are three sewing machines, a quilting machine and a serger in those containers, but less than three yards of fabric! Most of these boxes were mislabeled. I learned that if it said "Sewing Supplies" it contained anything BUT things I could use with sewing/quilting. I found four boxes of Christmas decorations, several boxes of toys, computer things (not EQ) and lots of papercrafting supplies. I didn't find my box of thread or any of my stash of fabrics. Onward! I will find fabrics, I will set up the quilting machine, I will find batting (there is a large box in the other room that *might* have my roll of batting) and I will be sewing/quilting on something by the end of this week (or else I will go bonkers!). May your week be most successful! And, to be inspired by people who really have design walls check out Patchwork Times! 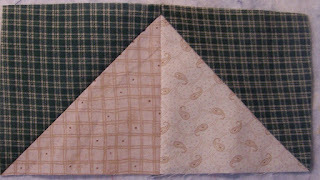 STEP ONE: Take 4 of the HST scrappy units from Clue #3, one scrappy diamond unit from Clue #4 and your four border fabric Chevron units from Clue #5 and sew them together for the center unit as shown. NOTE: IF you have borders around your scrappy diamond units (see Clue #4), use the one with the border fabric for this step. 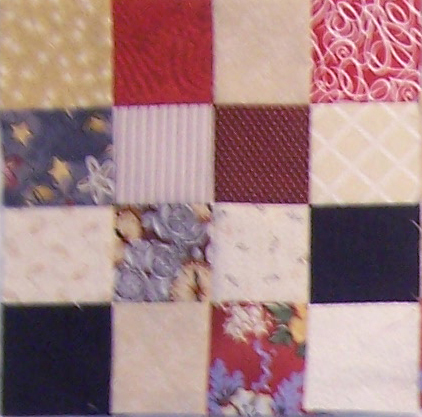 < STEP TWO: For the first border, take your 16 patch units from Clue #5 and sew them together in pairs. 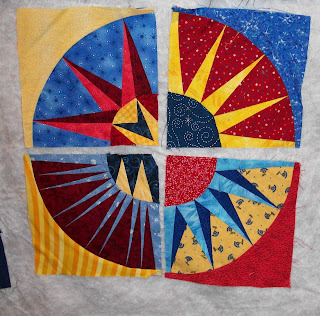 Then, using the scrappy diamond units from Clue #4 in the corners, sew these borders around your center unit. NOTE: IF you have borders around your scrappy diamond units (See Clue #4), use the ones with background fabric borders for this step. STEP THREE: For the second border, sew four scrappy Chevron units from Clue #5 together, end to end making four border lengths. Using the HST scrappy units as corner blocks, sew the borders to the quilt. < NOTE: IF you trimmed your HST to 5” in Clue #3, Cut twenty 1 1/2” X 5” strips of assorted background fabrics. 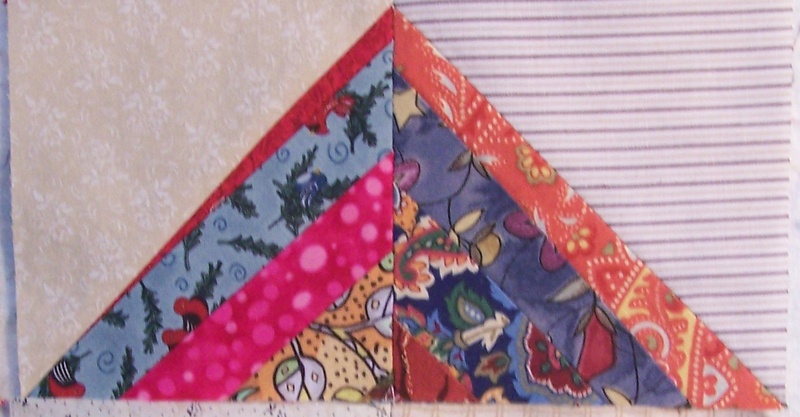 Insert these strips between the scrappy chevron units as you sew the four pairs together. Sew one strip to each end of your chevron rows. These are your border lengths needed for STEP THREE. 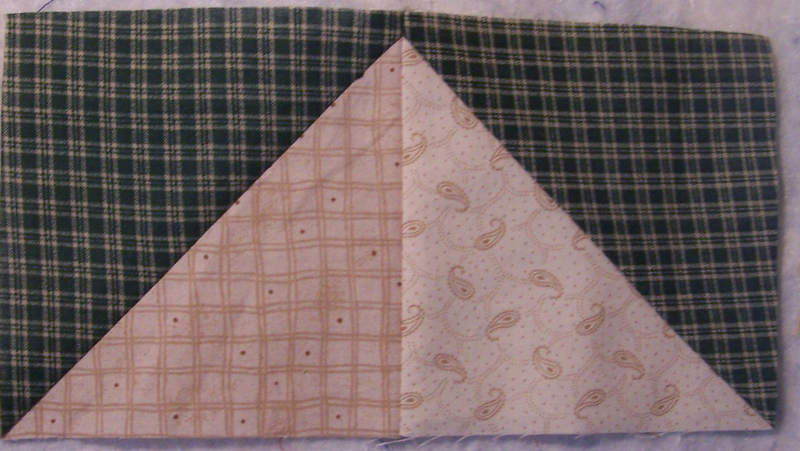 Sew borders to quilt as described in Step Three. 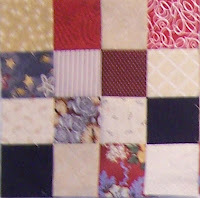 Cut 6 strips, WOF, 5 1/2” wide from your border fabric. Sew these strips together end to end. I like to use a diagonal seam, but use whatever works best for your sewing skill set. Take your quilt and measure the center from top to bottom and cut two pieces to this length from your border fabric strip, sewing them to the sides of your quilt center. Press the seams toward the borders. Quilt as desired. Suggested quilting would be any all over design as this quilt is SO busy that custom quilting could be lost! 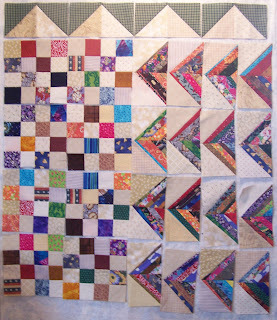 You can add more borders to make a bigger quilt. 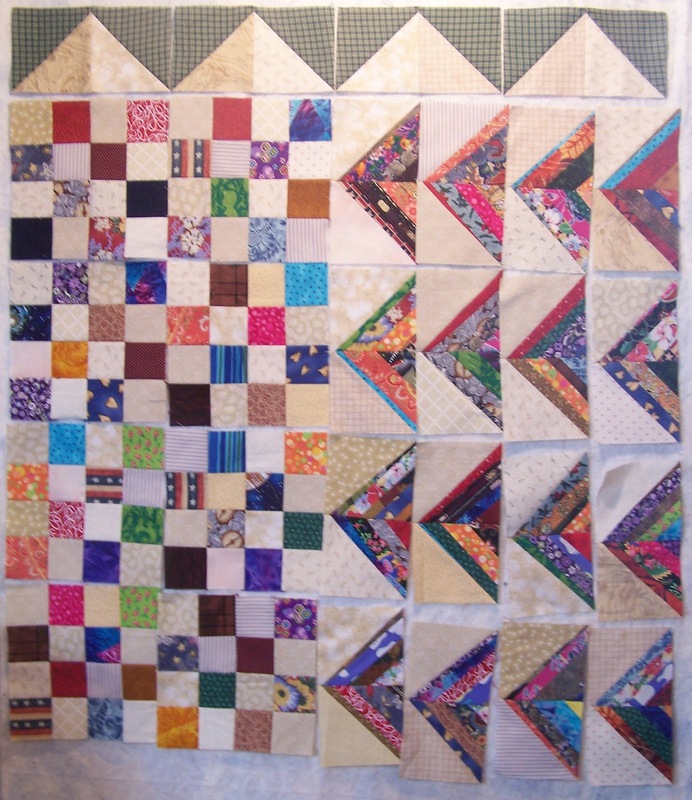 This quilt design will measure 80” X 100” if all units measure 5”... AND it uses up a bit more from the scrap bin! Our move is in process...please pray with us that we will get a closing date - SOON! 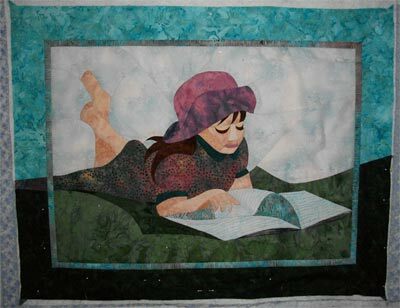 And may your sewing and quilting go smoothly while I am itching to quilt! I took down the Waterfall quilt because there are not enough hours in my day to get that finished before the movers come and pack us out of here...I will be working on that one again after I get set up in Michigan. So, I pulled out a quilt top that I have had sitting around for several years. All it needed was a border and quilting...so I started quilting, ripped out quilting, staring at the quilt to see what it needed in quilting design...and it is still up on the design wall trying to speak to me. For more design wall inspiration visit Patchwork Times. 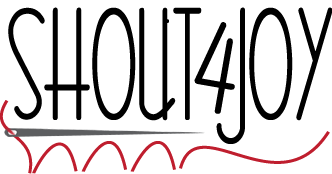 There are some great projects linked there! 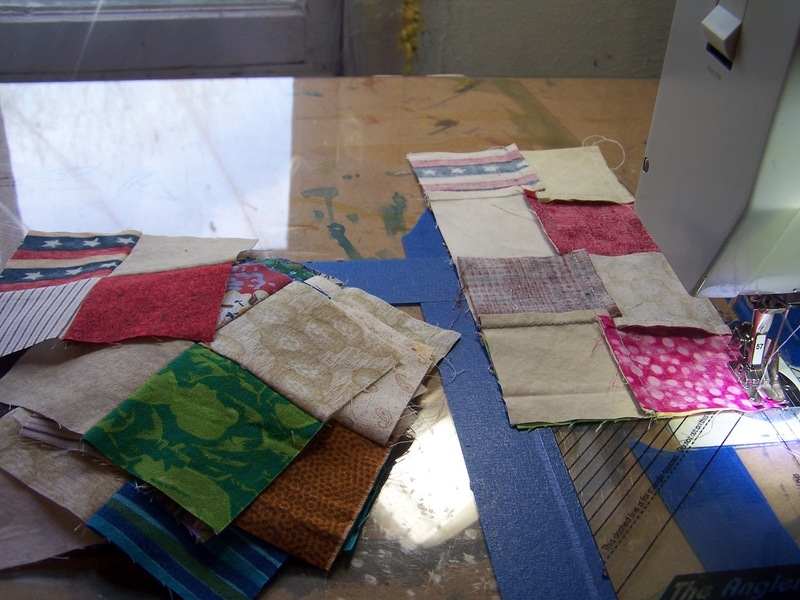 Take your 32 Four Patch units from Clue One and sew them into 16 pairs. 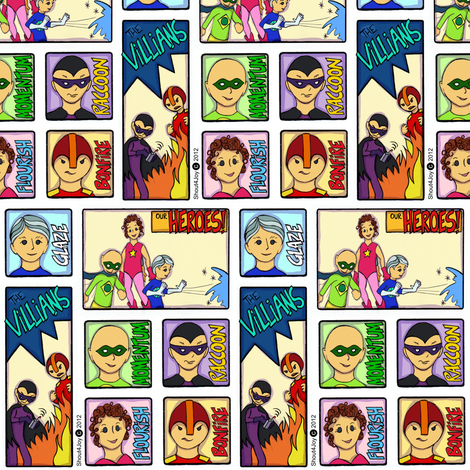 Sew the pairs together to make 8 Sixteen Patch units. Set aside for last clue. Take your 8 HST units from Clue Four and make 4 Chevron units with the background fabrics in the center. Take 32 of your Scrappy HST units from Clue Three and make 16 Chevron units with the scrappy triangles in the center. The final clue will put them all together – stay tuned!